I wasn’t a real big fan of this dish. I think it was the sun-dried tomatoes that didn’t good to me. Maybe I’ll swap those out if I try this dish again. 1. COOK pasta as directed on pkg., adding broccoli to the cooking water for the last 3 min. of the pasta cooking time. 2. MEANWHILE, cook chicken in 1/4 cup of the dressing in large skillet on medium heat 8 min. or until chicken is cooked through, stirring frequently. 3. DRAIN pasta mixture; place in large bowl. Add chicken and all remaining ingredients; mix lightly. Posted in Main Dish and tagged bow tie pasta, broccoli florets, chicken breasts, grated parmesan cheese, Italian dressing, sun-dried tomatoes. Bookmark the permalink. I loved this dish! So easy and so delicious! The only change is that I added the entire bottle of teriyaki sauce! I’m not sure why 1/3 cup didn’t cut it, but I kept adding the sauce until it had the taste I wanted, and by the time I was done, the entire bottle was gone! 1. HEAT oil in large nonstick skillet on medium-high heat. Add chicken; cook and stir 5 to 7 min. or until done. 2. ADD next 3 ingredients; stir. Bring to boil. 3. STIR in remaining ingredients; cover. Cook on low heat 5 min. Remove from heat. Let stand 5 min. Fluff with fork. 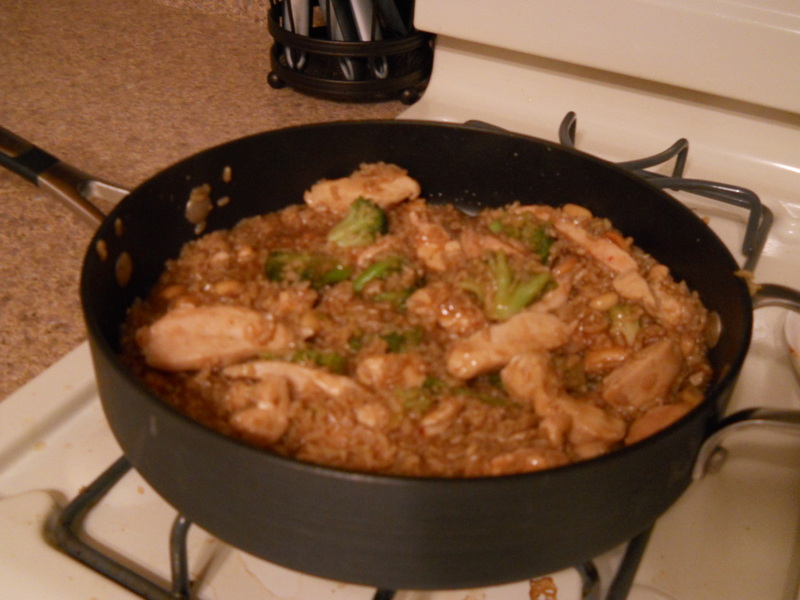 Posted in Main Dish and tagged broccoli florets, chicken breasts, garlic powder, instant brown rice, oil, salted peanuts, teriyaki sauce, water. Bookmark the permalink. I had such high hopes for this dish. I was a little disappointed in the outcome, but I think it had more to do with the chicken I used. I did not have any boneless, skinless chicken breasts. I ended up using bone-in, skin-on chicken breasts instead. While the dish turned out fine, the increased cooking time took a toll on the stuffing mixture. Next time, I will have the right chicken! 2. PREPARE stuffing in large saucepan as directed on package. Add apples, nuts, raisins and 1/4 cup dressing; mix lightly. 3. 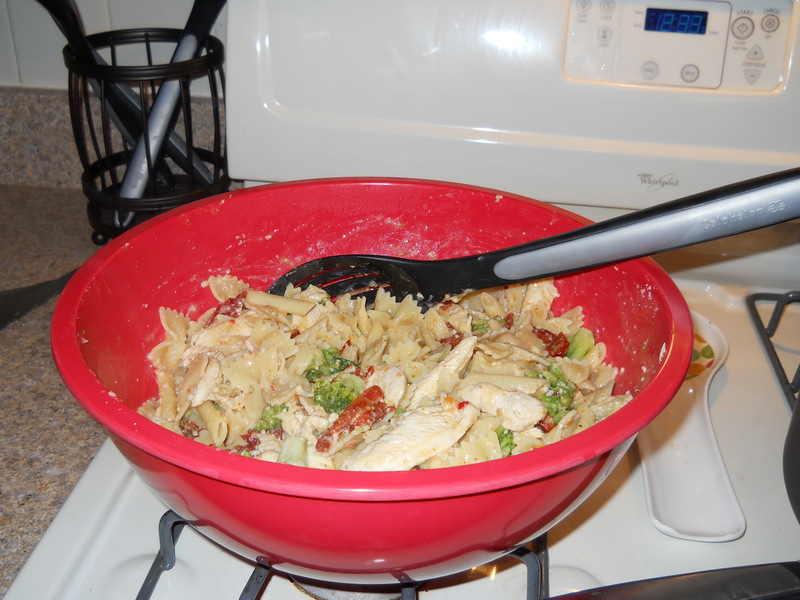 SPOON into 13×9-inch baking dish; top with chicken. Brush chicken with remaining dressing. Cover loosely with foil. 4. BAKE 35 min. Top chicken with cheese; bake 10 to 15 min. or until chicken is done (165ºF). 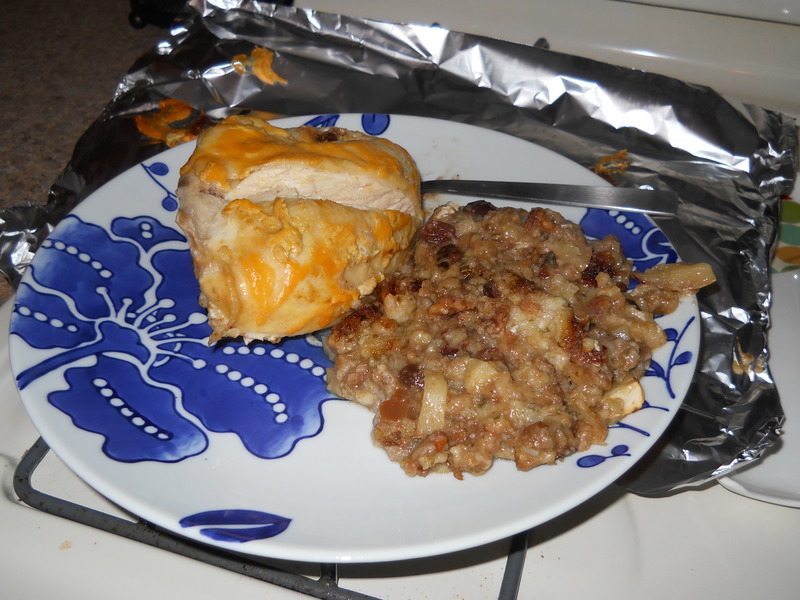 Posted in Main Dish and tagged apple, chicken breasts, chicken stuffing mix, honey dijon dressing, raisins, shredded cheddar cheese, walnut pieces. Bookmark the permalink. 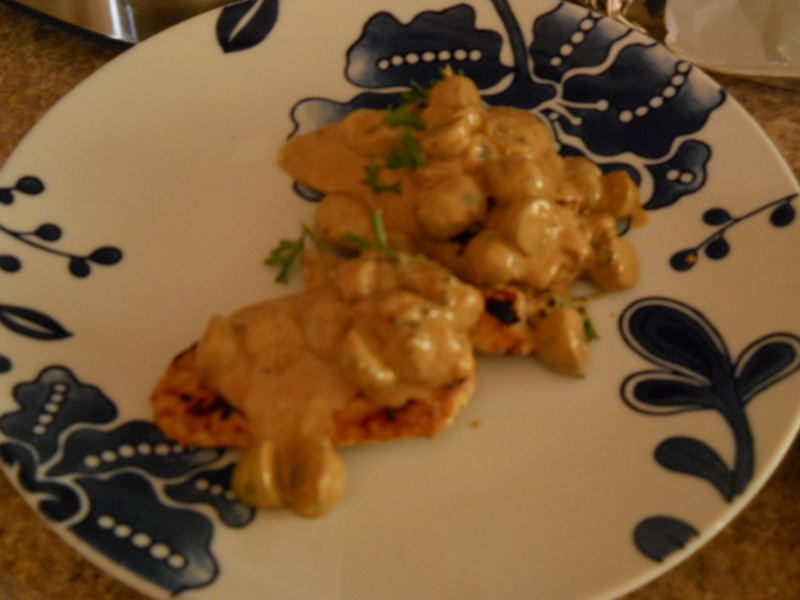 I loved this dish! It was so simple to prepare and the chicken came out so moist and tender. Delicious! 1. HEAT dressing in large skillet on medium heat. Add chicken and garlic; cover. Cook 5 min. on each side or until chicken is browned on both sides. Remove chicken from skillet; set aside. 2. ADD canned tomatoes and water to skillet; stir in rice. Bring to boil; simmer, uncovered, on low heat 10 min. Return chicken to skillet. Top with cheese; cover. 3. COOK 5 min. or until chicken is done (165ºF); top with remaining ingredients. Posted in Main Dish and tagged chicken breasts, cilantro, diced tomatoes, garlic, instant brown rice, light house Italian dressing, shredded mozzarella cheese, tomato, water. Bookmark the permalink. This recipe had some unique flavor and texture combinations. I’m still not sure how I feel about this dish. It wasn’t bad at all. It was just . . . different! 1. HEAT dressing in large skillet on medium-high heat. Add chicken; cook 10 min. on each side or until done (165ºF). Meanwhile, blend milk and cream cheese in blender until smooth. 2. TRANSFER chicken to plate; cover to keep warm. Add cream cheese mixture and lemon juice to skillet; cook 2 min. or until heated through, stirring occasionally. Stir in zest and grapes. 3. SPOON sauce over chicken; top with parsley. Posted in Main Dish and tagged chicken breasts, cream cheese, green grapes, lemon juice, lemon zest, milk, parsley, Zesty Italian dressing. Bookmark the permalink. At first, I wasn’t feeling this dish. But once it came out of the oven and it was all ready, I sat down to eat, and I was pleasantly surprised. It was delicious! So delicious, I didn’t even have time for any pictures! 1. PREHEAT oven to 375ºF. Combine tomatoes, corn, onions and 1/4 cup of the dressing. Pour evenly into two 15x10x1-inch baking pans; spread evenly to cover bottoms of pans. Pour remaining 1/4 cup dressing over chicken in large bowl; toss to coat. 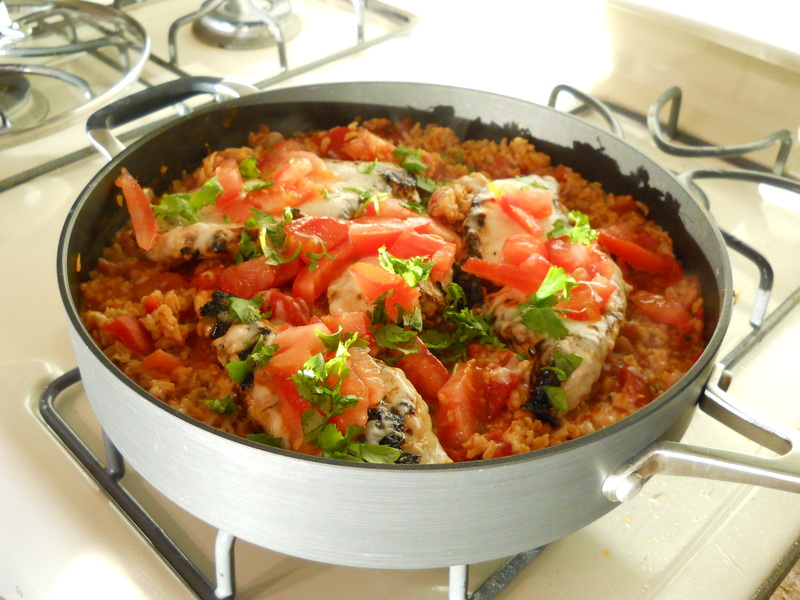 Top tomato mixture in each pan with 5 of the chicken breasts. 2. BAKE 45 min. or until chicken is cooked through (165ºF). 3. TRANSFER chicken to serving platter; cover to keep warm. Mix both tomato mixtures in medium bowl. Add cheese and cilantro; stir until well blended. Serve with the chicken. Posted in Main Dish and tagged chicken breasts, cilantro, corn, Italian dressing, onions, shredded sharp cheddar cheese, stewed tomatoes. Bookmark the permalink.